Do you ever need to retreat from the world and watch a feel good movie? A movie that will make you feel better just for watching? I know that I do... indeed, I have a number of go to films just for this purpose. Netflix is a great destination for feel good flicks. 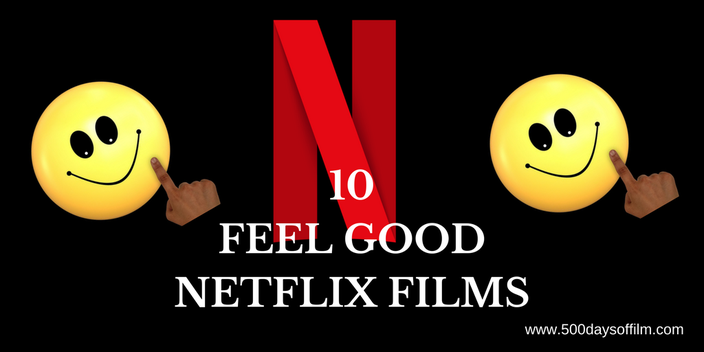 Here's a list of 10 Netflix movies guaranteed to make your world feel brighter. I'm not sure that I could love Taika Waititi’s Hunt For The Wilderpeople any more than I already do - although I am always willing to give it a try. This story of defiant city boy Ricky Baker (Julian Dennison) and his final chance foster family in the New Zealand countryside is an absolute joy. I could watch Sing Street any day of the week - it always makes me feel better. Who can resist Conor ‘Cosmo’ Lalor’s musical attempts to woo the beautiful and mysterious Raphina? However, for me it is Conor’s older brother, Brendan (Jack Reynor), who steals the show. A wonderful feel good classic. John Hughes, an iconic performance from Matthew Broderick, Cameron (Alan Ruck) standing up to his father, dancing in the street. Really, need I say more? I have a confession… I am not a huge fan of costume drama. However, I make an exception for Love & Friendship. Whit Stillman’s wonderfully wicked adaptation of Jane Austen’s early novella has me laughing within seconds. Ira Sachs’ Little Men is not a comedy or even a traditionally feel good film. However, this tale of the friendship between two 13 year old boys is so beautiful and emotionally intelligent that it always makes me feel better just for watching. Who can resist Elle Woods? Her ever optimistic (and often hilarious) quest to prove everyone wrong is surely the cure for even the darkest of days. The Little Prince is a gorgeous Netflix Original animated movie based on the classic book (of the same name) by French writer, Antoine De Saint-Exupery. If you are in need of a family film that is entertaining, fun and full of wisdom about love, loss and what truly matters in life, look no further. Another (loose) adaptation of a Jane Austen story (Emma), Clueless is a feel good classic - an enduring, effortlessly funny eminently quotable movie that guarantees to bring a smile to your face. This true life tale avoided the darker parts of Eddie Edwards’ story to focus on his against the odds achievements. This is a film that wants us to feel inspired (and we do), it wants us to laugh (and we do) and it wants us to feel moved by the plucky spirit of this remarkable underdog - and we are. I didn’t know much about Dark Horse before I sat down to watch Louise Osmond’s inspirational documentary. This is a movie about beating the odds. Let’s face it, there are few (cinematic) things better for lifting your spirits than seeing an underdog rise up and win - particularly when that story is true. What are your favourite feel good movies (on Netflix or elsewhere)? Do let me know… leave me your recommendations in the comments section below! Glad to see Sing Street get some love. It is a very good movie. I still need to see The Hunt for the Wilderpeople and Eddie the Eagle, among others. I love Sing Street so much... it is great to spread the word about this film isn't it! I think you will also love Hunt For The Wilderpeople. Let me know what you think!